Ambassador Melanne Verveer, Fellow recipients of the IWOC Awards 2010, Distinguished guests, Ladies and gentlemen; All protocols observed. It is a great honor and humbling experience to be here to receive this award tonight. 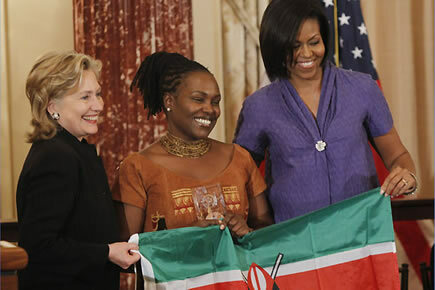 Great because this is a distinguished award that is dedicated to honoring women who have made a contribution globally and humbling because I am only aware that without the many women with whom I have had the privilege to work with at the grassroots in Kenya, it would not have been possible to celebrate anything much less for me to be here with you tonight. It is for this reason that I want to dedicate the award to all those women in Kenya who have simply refused to give up the hope for a better Kenya. I am talking about the woman in the Kenyan urban shanties and rural poor who has to endure the terror of local chiefs and the extortion and abuse of local police every single waking day just to get along with their lives; women who pay tax to maintain these government officials but have no voice to control them or hold them to account because their MPs are too busy stealing from them or plotting on the next electoral violence to care. These are the women I work with every single day. But I am also talking about the middle class woman who is starting to ask hard questions about our social and economic inequalities; the young executive who has started discarding the notion that the public space is male space; or that it is only bad girls that venture into politics; for we know that unless a new breed of leaders committed to a new kind of ethics and values that celebrate merit, excellence, service and accountability take over leadership, or unless by divine intervention those currently in power are transformed, my generation’s sad story will be the story of my daughter’s generation. And the generations after. It is a combination of this fear and the inspiration I see in the eyes of mama mboga as she works through the day in the dusty shanty towns in Nairobi or as she toils away in the sun baked earth of Machakos that gives me the drive to keep going inspite of the unrelenting repression of government and police brutality. One of the great paradoxes of my country is that we have a government elected “democratically” but which is habitually undemocratic; a creature of movements such as ours but which has shown bad manners in dealing with those who seek to hold it against its promises. Kenya’s story is part of the sad African story. But in that story a new story is evolving, the story of a people who are determined to make a clean break from the terrible legacy of unaccountable leadership and predatory governments; a story of people who are increasingly rejecting ethnic and political patronage in favor of democratic and accountable government; a story of people who are seeking transformation and not sedation through welfare; and it is a story of people who know that in Africa, we’ve got all the wealth we need to raise the continent from grinding poverty, disease and a sense of pervasive hopelessness into a prosperous land. A land from which no young woman or man will want to escape from to be an economic refugee in Europe, the US or anywhere else because it will be a land of opportunity. It is with this breed of Kenyans and Africans that I identify myself and my work with. It may be the Pioneers for Change, the Women and Youth Alliance, Bunge la Mwananchi, G10, KPTJ, among other progressive movements , but they are all united by one thing; to make sure that the transition in Kenya is substantive and not a vacuous formality. I have dedicated my time and energy at the Centre for Rights Education and Awareness(CREAW) and the Africa Community Development Media (ACDM) to make my contribution towards this great goal. I and my generation feel greatly privileged to be a point in our history where we can make a historic contribution. In this we are greatly motivated by the achievements of the US, the South East Asian Tigers and the economies of Latin America. This last Friday, 5th march- 2010, I celebrated my 45th birthday away from home . However in the midst of celebrating this personal landmark, two grim realities hit me right in the middle of my eyes. First, back home, my colleagues held a memorial service in remembrance of two of our fallen human rights defenders ; GPO Oulu and Oscar Kingara both executed in cold blood on the same day last year ( â€“ 5th march 2009- ) by state police in broad daylight right outside the University of Nairobi because of their dedication to bring to an end state sponsored terror. Student protests were met with a further execution of one of the students. To date state “investigations” have revealed nothing. It has joined the long list of unresolved politically motivated murders in Kenya. Such is the perilous reality of human rights defenders and the Kenyan public in my country today. The second reality was that my country’s life expectancy has fallen to 44 years. I am therefore lucky to be alive today! Kenya is indeed a beautiful, great and profound country situated in East Africa with a population of approximately 40 m Kenyans . Ever since we produced and exported the incumbent President of the biggest super power in the world- President Barack Obama, our claim to greatness was vindicated! Yes, We have a track record not just for producing and exporting Presidents , but it is in our country that you find such great names like Wangari Maathai- the environmentalist, our amazing athletes, the very hard working people, the vibrant civil society, rolling mountains and scenery, singing birds, great weather, wonderful natural resources and indeed some of the best tourists destinations in the world! Kenya has the potential to not only feed her people but be the bread basket of the whole continent of Africa- While it can have enough for everyone, poor leadership and governance, corruption, impunity and lack of accountability have determined that there is not enough for a few greedy men and women. The high levels of inequality have determined that over 70% of the country’s resources are in the hands of a less than 10% of the population while the last 10 % of the population own less than 1% of the country’s resources. It is a country where women provide over 70% of the total labor in the agricultural sector and yet, own less than 5 % of the country’s land. It is a country where over 47 % of the country’s population live below the poverty line earning less than a dollar a day, with 70% of those extremely poor being women. It is a country where the women and youth make the majority of populace and yet remain at the peripherals of decision making- a country that has 89% of its population below 45 years and yet this majority remain marginalized and excluded in governance, decision making et al. It is a country that has been seeking reforms of its key institutions of governance including the constitution but where the said reforms have remained a mirage due to state capture of the said instruments of reform. This enduring legacy has created and fertilized a culture of impunity, abuse and disregard to state institutions of governance, lack of accountability and a culture that disregards international norms and standards of governance and human rights protection. The political system of first by the post , winner takes it all makes elections a life and death matter always in favor of a small very powerful clique of the political class. Many other institutions like the cabinet, parliament, judiciary, police force, military including media and religious institutions have come under total and stifling elite capture. The outcome of this elite capture is a fractured political and social system , absence of transparency and accountability, mismanagement of state institutions and impunity that have eroded the national fabric resulting in serious tensions- Not surprising therefore that between Dec 2007 and March 2008, Kenya faced its worst political and governance crisis yet and almost degenerated to a state of total breakdown of law and order. The question of police brutality and complicity in perpetrating crime in general and violence against human rights defenders in particular is one of the biggest challenge within the existing Coalition government. The atrocities of the police are well documented; by the state human rights agency KNCHR, UN Rapporteur on Extra judicial killings; the government appointed Commission into Post Election Violence (CIPEV) which recommended a complete overhaul of the police force. earlier on at the conclusion of the Investigations into the Post election Violence by the popularly as the Waki Commission ( CIPEV) â€“ sadly, and instead of implementing the recommendations, the President responded by rewarding the then Commissioner of Police with a new appointment and a promotion for officers implicated in sexual assault and violence against peaceful Kenyan protestors. The story of GPO Oulo and Oscar Kingara is the story of so many other human rights defenders in Kenya and in countries where there is no respect for human life, rule of law, democracy and accountability. It is the story of so many other human rights defenders who have paid and continue to pay heavy prices for exercising their fundamental and constitutional rights. When human rights activists in Kenya like in other countries like Zimbabwe, have sought accountability from the powers that be, the response of the authorities has been an escalating intransigence and violence, the violence of police dogs, tear gas, “disappearing”, exile, and even death. Like Bishop Desmond Tutu said at the height of apartheid, ” We who advocate peace are becoming an irrelevance when we speak peace. The government speaks rubber bullets, live bullets, tear gas, police dogs, detention, and death”. It is for this reason that while I humbly accept this award, I dedicate it to all the human rights defenders in Kenya. They are the true champions and heroes of our struggle for change. They continue to put their lives in harm’s way because they are convinced that a different and better Kenya is possible. A different and better Africa is possible and a different and better world is possible. Many of them like Oulu and Oscar have paid the ultimate price. We are tired of being divided, tired of running into ideological vacuums and partisan roadblocks, tired of appeals to our worst instincts and greatest fears. It is too late to stop this movement. Change must come! We hear the voice of the people of the United States of America urging us on, we hear the voices of the people of Europe urging us on, we hear the voices of the peoples of the world urging us on; we see the changes taking place all over the world; we see nations rising from poverty and underdevelopment and creating economic miracles and we ask why not in Kenya? Why not in Africa? We see undemocratic Nations being replaced by democracies and we ask why not in Africa? We see millions being hauled out of early death with benefit of modern medicine and we ask why not in Africa? We read about the immense wealth in the belly of the continent and the endless miseries of the people living above the grounds and again we ask why in Africa? Like Kennedy, I belong to those who believe in the power of a dream. Like him we dream of things that are yet to be and we ask why not? I understand that it is my duty and that of my generation to replace the present despair with a new hope in the continent of Africa; it is my duty to resist oppression and plant the flag of freedom in every homestead; it is my duty to challenge the massive inequalities that exist in my society and those of all other African states; it is my duty to stand up to grand corruption; to challenge police brutality and complicity in crime; it is my duty to prevent the recurrence of the post election violence in Kenya in the next general election; it is my solemn duty to prevent more and more children from the violence and violations that continue to be visited upon our people; it is my duty because where leaders cease being role models and sources of inspiration, we must turn inwards and look for that inspiration from within ourselves. And we must stand firm in our place in the queue and never drop the ball; it is our duty to pick up the challenge that has rung from DC and across the World, that time is now for a new generation of leaders to emerge and to take the onerous task of completing the change begun 20 years ago to democratize, bring prosperity to our nations and to protect the rights and freedoms of every person in my country and in my continent. It is a call I am willing to accept even if I were alone. For didn’t Rosa Parks shows us right here in the USA the amazing power of a solitary soul committed to end injustice? A great Kenya for all is possible â€“ for the dignity of (Wo)man and the destiny of democracy. We want our Country Back!